"Blueberry vines by any other name still yield a tasty treat!" Most commonly referred to as blueberry plants or blueberry bushes, but also called blueberry vines, blueberry trees, and blueberry shrubs. No matter what you call them the result is the same - fresh blueberries! True Vine Ranch is a family farm dedicated to offering premium blueberry plants for sale and providing excellent customer service. We are happy to answer your blueberry questions. We check our e-mails daily. Our telephone hours are Monday - Friday 8am - 4pm CST. Farm pick-up of your order is by appointment only. Please contact us 2-3 days in advance to make an appointment. Go to Google Maps for a Map and Directions to True Vine Ranch. We accept MasterCard, Visa, Discover, and American Express for on-line orders or payment via PayPal. Please call 913-441-0005 to order for payment by check or if you prefer to make your credit card payment by phone. We can personally deliver larger orders. We welcome farm pick-up of your order by appointment only. Please contact us 2-3 days in advance to make an appointment. We offer volume discounts for 50 or more plants. Please contact us for details and to place your order. If notified within 30 days of delivery that your plant died, and you followed our written and verbal instructions, we will replace that plant free of charge. We do not refund money. We are available by phone or e-mail to answer any questions. 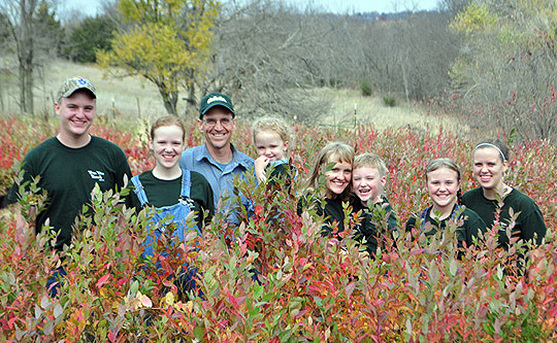 In 2010 we purchased Waters Blueberry Farm in Smithville, Missouri and the website www.watersblueberryfarm.com. We moved the business to our farm in Bonner Springs, Kansas and changed the company and website names.